It is the story of Lizzie Tennyson a young mother and wife who sacrificed her nursing career to follow her husband’s dream: to own a pub and restaurant in the Lake District, far from their home in southern England. Lizzie dreaded the move away from friends and city life but surprised herself with a love for the place and people, while also discovering a keen aptitude for business, for making it profitable and popular beyond expectation. Lizzie embraced the community and they, in turn, loved and supported her. She wasn’t a beautiful woman but she exuded a magnetism and friendliness that drew people to her. She was hard working and self sacrificing, a community organizer extraordinaire. Then shadows from the past pressed in, threatening Lizzie’s perfect life. A new side of Lizzie emerged: unusual reactions, anger, feelings of abandonment and betrayal. Bad things seemed to cascade as Lizzie’s life unraveled. Could she pull it back together and was Lizzie really who she appeared to be? Some people saw the chinks, behavior that didn’t add up: a policeman, an elderly neighbor, and an ex-soldier suffering from PTSD. But how could it be when she was so charming and such a good friend? 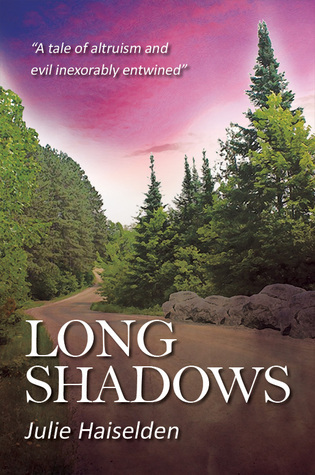 Long Shadows was a terrific book, the perfect mix of suspense and mystery as well as a fascinating psychological portrait of an intriguing woman. I empathized with Lizzie, lulled in by her magnetism and then, like some of those around her, I began to question her altruism and motives. Lizzie was well fleshed out, charming and vulnerable; the devoted friend, wife, and mother. She had a humor and wit that made me laugh out loud at her observations of people’s foibles and idiosyncrasies. The pacing was perfect. There were subtle hints and clues along the way that kept me turning the pages. Haiselden sets up scenes with such detail, so perfectly rendered that I felt like a fly on the wall, observing every nuance of emotion and expression. The settings were beautifully described, often mirroring the internal landscape of Lizzie’s mind. Long Shadows is a wonderful book and beautifully written. I truly loved it and simply could not put it down. I am now a Julie Haiselden fan and look forward to reading more from her. As the author, I very much appreciate this detailed and well-written review. Positive reinforcement means so much from every reader and coming from a fellow writer, it’s extra special! Thank you, Julie. I loved your book! What a fabulous review, Julia! I lived in the Lakes for a while. It’s a breathtaking setting for a novel, and the community.. well, need I say more! I shall add this to my reading list. Sue, Thank you for taking the time to read my review and comment. Julie’s book is wonderful! I am sure you will enjoy it. Thank you for your kind comments, Sylvia! This is a book that had me pondering life and quirky characters, the nature of evil, long after I had finished it. Julie Haiselden is a wonderful writer and I am sure you will enjoy Long Shadows. She has another book coming out later this year, and I look forward to reading that.